I couldn’t help but feel bad for this little Ford Ranger. Having been subjected to years of abuse and neglect, it looked absolutely terrible. I knew that under all that dirt and grime was an honest machine that had plenty of life left in it—if only I could work some magic to bring it back from the brink. Mold, dirt and oxidation with paint nowhere to be seen. I’m a sucker for vehicles that straddle the line between pride-and-joy and junkyard-bound. I’m talking about vehicles that actually run pretty well and aren’t rusted out, but have so many superficial faults that most people would mark them up as junkers. I like to give machines like this some Tender Loving Care, ultimately turning them into an object of desire. So much junk and filth. Note the seat belt condition. I won’t get into too many details of how I came into possession of this Ford Ranger. Basically, I had been given the duty of selling the truck. The owner was aware of the vehicle’s poor condition and only wished to get $1,750 out of it. However, I do have some standards when it comes to vehicles, and there was no way I was going to sell this thing in the shape it was in. The truck’s owner could really use the money from the sale, so I figured I’d help them get the most out of it as possible. Ah, an ABS light. But, low miles! Making the truck perfect was not the goal. Instead, I set out to make it into a safe, reliable and relatively clean vehicle for as little financial outlay as possible. First, the truck was beyond filthy. It was disgusting to look at, let alone get in and drive. First things first, the Ranger needed a deep clean. I ran it through a car wash and power washed-away all the loose debris like leaves, sticks, and the top layer of dirt. From there, I began hand washing the body. There was defined layer of dirt that I scrubbed away with a soapy sponge. That black stuff was more than just dirt. The interior was arguably in worse shape that the exterior. Aside from all the junk, cheap tools, and trash that had collected inside of the cab, there was a film of dirt and grease on every surface. The carpet had stains galore; even the headliner and windows hadn’t escaped the mess. I used every interior detail spray in my arsenal to turn this living space around. I went through so many rags because each one kept loading up with dirt as if the Ranger’s interior had its own ecosystem. I employed the Shop-Vac to vacuum the seats and carpet. I even went at length to remove the seats because the carpet was saturated with every particle known to man. Nearly all the crap vacuumed up. Since I mainly used cleaning materials I had laying around the garage, I didn’t end up spending any money here, which was nice. Having finally reached an acceptable level of cleanliness, I decided to begin my focus on the truck’s numerous mechanical issues. When I was driving the truck back to my place, I couldn’t help but notice the ABS warning light illuminated on the dash. The terrible braking performance and super-mushy brake pedal also contributed to a genuine feeling of concern. The brake system is one of the most important systems in a vehicle, and it was in terrible shape on this truck. I whipped the front wheels off to observe the condition of the front brakes, as they provide a majority of the vehicle’s stopping power. Once there, I was met with the most decrepit looking excuses for brake pads I had ever seen. Not only was there hardly any pad material remaining, but the pad backing plates were rusted and seized to the mounting bracket. To further my disbelief, one of the sway bar links was also snapped in half. The brake rotors were still usable. Remember - repairs on a budget! I threw some new pads on there and lubricated all the moving parts so that there wouldn’t be any further binding. I also installed a new sway bar link while I was in there. With the front brakes (and suspension) back in working shape, I moved to the rear. Removing the wheels again left me in awe - the drum brake hardware was corroded, seized, and generally non-functioning. I sourced an affordable new drum brake hardware kit which I then mounted up to the rear hubs. I applied a generous amount of lubrication to all moving parts (which there are a lot of) and reinstalled the old brake shoes and drums, as all were still in good shape. From there I adjusted the parking brake rotating assembly which allowed the shoes to fit snugly within the drum. Even after properly adjusting the rear drums, I found that the brake pedal was still spongy and completely unsafe. I did some research on good ol’ Google and found that this soft brake pedal is common in Ford vehicles of this time period. Apparently, the fix to it was behind the brake master cylinder. Two nuts saw the master cylinder removed from the brake booster where I was met with a threaded rod. My objective was to unscrew the threaded portion of this rod (out about two turns) so that it took up the slack between the brake pedal and the master cylinder. With the master cylinder bolted back up, I have to say that this simple and free adjustment did the trick. The brakes now had great initial bite and the pedal was firm - result! At some point in the past, someone had cut the ABS sensor wires. I presume this was because the ABS dash light had come on (because the sensor was bad), and someone figured that cutting the wires going to the sensor would be a surefire way to put the light out. Unfortunately, that’s not how electrical circuits work. I repaired the wiring then removed the rear ABS sensor to test it out with the ohmmeter. Sure enough, the sensor was kaput! I picked up a new sensor, installed it, then took the truck for a test drive. The ABS light went away and the system was once again armed and ready for action. The truck’s engine ran well with no issues present. However, there wasn’t any record of when the engine oil was last changed. I decided it was a good idea to drain the oil and refill it with some fresh 5W-30. With a new oil filter also installed, the engine would now be good to go for a while. Back when I was working on the brakes, I noticed the ABS sensor I pulled from the rear differential was caked in a gray sludge. This was a good indicator that the differential oil needed to be replaced. I popped off the differential cover and out came a waterfall of thick gray fluid. It looked bad and smelled even worse. Once all the old oil was drained, I put a new gasket on the cover and bolted it back to the differential. I then refilled the differential with some fresh 80W-90 gear oil. Both front seat belts were ripped up, wouldn’t retract, and had been poorly “mended” with green duct tape and paper clips. It looked quite frightening to say the least. Luckily, I was able to source some nice replacement belts from the local junkyard and swapped them in. With that monstrous safety issue taken care of, I set to tackle some of the interior’s electrical gremlins. The first of which was the driver’s side electric window that wouldn’t go up or down. I could hear a relay clicking when I depressed the window switch. This told me that the switch worked and that the window motor was the likely culprit. Installing the new window motor was a pain because the original one was riveted to the door. I had to find some low-profile nuts and bolts to secure the new motor to the door frame. After about an hour of fumbling, the new motor was in and the window rolled up and down as expected. The electric door locks were next on the docket to be fixed. Neither door lock actuator was functioning. When you pressed the lock button, you could hear both door locks trying to do something, but they just didn’t have much strength. A while back I did a write up on how to repair a door lock actuator, but since the new actuators were only $16 and I was in a pinch for time, I replaced the broken ones for new. You can see that the new lock actuator design has changed from the original ones. No matter, they still mount up in the same way! With new lock actuators installed, the doors locked and unlocked with authority. Now it was time to deal with the nasty, grimy, sticky, and completely broken steering wheel-mounted cruise control buttons. I was pleasantly surprised when I found that brand new replacements were available for about $22. Removing two small bolts was all it took to pull the airbag from the steering wheel which granted me access to the cruise control buttons. I plugged the new switches into the existing wiring harness, bolted the airbag back to the steering wheel, and that was that. What an improvement it made to the look of the steering wheel. The final interior issue to be addressed had to do with the seat back adjustment lever on the driver’s seat. The lever was still attached, but it felt as though its pivot point had sheared away causing the lever to flop around. Ultimately, it prevented the seat back from being adjusted. With the driver seat removed, I pulled away the upholstery from the left side to get a better view of the seat back lever. Sure enough, the lever’s pivot point was snapped in half. Unfortunately, the lever was made of plastic so it wasn’t ever going to last through a series of clumsy human operators. After some head-scratching, I developed a MacGyver’d repair solution. I decided to drill through the center of both the adjustment lever and the broken pivot dowel, then screw the two pieces together with a long wood screw. Surprisingly, this repair actually worked. With the seat buttoned up and reinstalled in the truck, the seat back could once again be adjusted. Sweet! 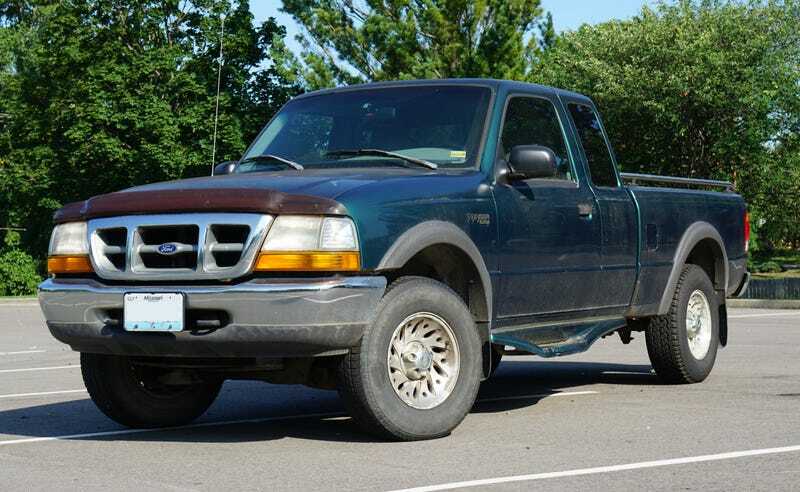 Aside from thoroughly cleaning the inside and outside of the Ranger, there were some further steps to take in order to make the truck really stand out. I wanted to remove the side steps under the doors and the rock guard from the hood. These aftermarket items had not aged well and really brought down the overall appearance of the vehicle. With those pieces removed, it was time to turn my attention to the headlights. They were foggy and oxidized, which happens to all older plastic headlamps. Instead of trying to revive them, I elected to buy a new set for less than $40. What a huge improvement this simple replacement made to the front of the truck. The final cosmetic procedure was to give the truck’s paint a good waxing. I went over the body with an electric buffer which really helped restore the clear coat’s luster. With a final coat of wax applied, I stepped back to observe the truck. I knew that appearance was there all along, it just needed someone to bring it out. I’m not claiming there was any profit here because that was never really the objective. I simply had the goal of getting the owner the most return from the truck as possible. Taking on a mechanical revival like this neglected Ranger is good for the soul. With only $250 spent on repairs, this truck has been saved from the junkyard and can now be someone’s pride and joy. That’s the sort of feel-good story I can get behind.